What is The Bloomsbury Group? The Bloomsbury Group is a group that was set up in EC London 30+ in 2016. Students who are studying for ten weeks or more are welcome to join. The purpose is to bring long-term students from different levels together to share experiences, talk about their studies and to enjoy a variety of events. The group is organised by teachers Jess, Ayan and Chris who are all long-standing members of the EC staff. This week was an important event for a group of newcomers to The Bloomsbury Group. The meet and greet event took place in the 30+ study area. This was an opportunity for students, new and old, to get to know each other and share experiences. One of the most useful things to come out of this was the sharing of the students’ personal study skills. By sharing tips and learning experiences, the students were able to leave with a variety of learning methods and techniques to take into their own studies. Also, students were able to give advice on how to make the most of their time outside of the school. With all student ideas teamed with the teacher’s local knowledge, all were able to take away at least two new places to visit in London. 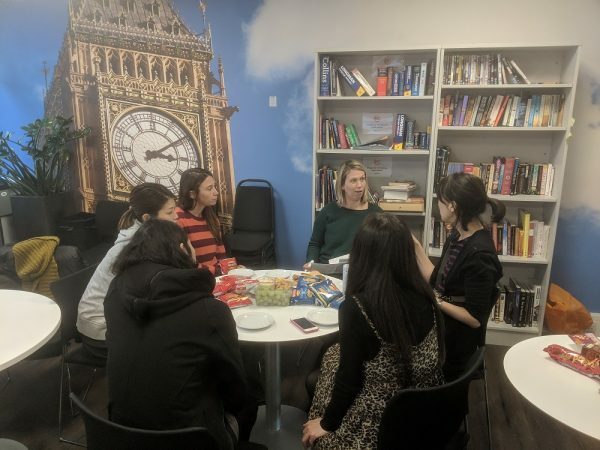 All Bloomsbury Group events provide a comfortable environment for students to meet other students, share experiences and have fun. Food and drink is provided and the meet and greet is just the start. Other events have included sewing, a book club and various outings including cinema, museum and theatre visits. Are you also looking for a comfortable environment to learn new skills? EC runs a Celta course in London so click to find out more if you think that a career in teaching might be for you.